Now through Sat, September 15, 2018 5:00 P.M. Throughout Spring and Summer every corner of the Free Library of Philadelphia will be taking inspiration from In Our Nature: Flora and Fauna of the Americas - an exhibition in our Rare Book Department's Dietrich Gallery. The Business Resource & Innovation Center will be the site of the first sneak preview of spinoff plant and animal programming to come. While the BRIC primarily serves entrepreneurs, businesses, and nonprofits, it is also the Parkway Central Library's main home for books on science, health, technology, trades, and industrial crafts. Consequently, generations our city's green thumbs have browsed its shelves for works on botany, ecology, gardening, horticulture, and more. In hosting this photo exhibition, the BRIC celebrates their sister and brother civil servants from Philadelphia Parks & Recreation’s Urban Forestry & Ecosystem Management divisions. Our city's arborists care for the trees on 10,250 acres of park land, and the 117,000 trees along the city streets. These men and women are passionate, hardworking, and proud of the work they do to keep Philadelphia’s trees healthy and its citizens safe. 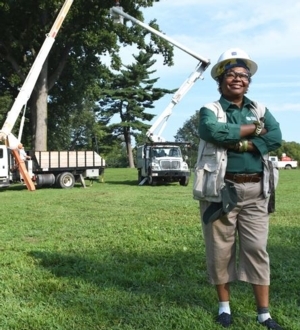 For this project, photographer Sabina Louise Pierce worked with Park & Rec's TreePhilly program to capture the special relationship between arborists, the trees they care for, and the tools of their trade. Free and open to the public during all open hours, with occasionally limited access during BRIC programs.